Attention all 2018 graduates and 2019 rising seniors — get excited! EduCareer Expo is coming to Fair Park on June 27, 2018! Calling all graduates, are you ready to take the next steps toward your career? Or will you be graduating next year and want to plan ahead? No matter your situation, we know that college can be confusing. Don’t worry, the Dallas Community Colleges are here to help! Be sure to enter through gate 2 for FREE parking! 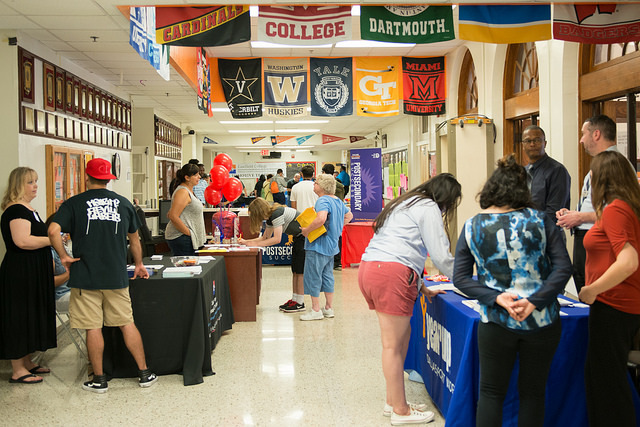 Explore the college information and resource fair featuring DCCCD, UNT Dallas and SMU. Get assistance with DCCCD admissions, financial aid and TSI pre-assessment. If you’re a Dallas ISD or Garland ISD student, you will be able to pick up your final transcript. If you’re a Dallas County Promise scholar, you will have the opportunity to meet your Success Coach! Future Dallas County Promise scholars can come and learn all about the process to get started. Meet the DCCCD student street team. Get your meningitis shot. First, find out if you meet the requirements. The Dallas Community Colleges will be there to provide onsite assistance and answer questions. Between all seven of our colleges, we offer just about any program you can think of, whether it’s an associate degree or a technical certification. So, no matter your interests, be sure to check out our programs. Need help getting your bearings? Sign up for an orientation. Think you might be missing some general education requirements? Take an assessment exam. Have questions? Contact our outreach team.